Beth Gruber has held countless positions during her 26 years of volunteering for Sigma Delta Tau, including National President, National Vice President, Membership Recruitment Chairman, House Corporation Officer, and as a member of the Jewish Outreach Team. She has also served as Extension Chairman, Chapter Advisor, House Corporation Officer, Centennial Chairman, and on the NPC Delegation. She is a graduate of Phi-Penn State University. We sat down with her to discuss our National Convention and what it means to attend. With other members of National Council at the 2012 Convention in Atlanta, Georgia. Q: You just served as Centennial Chair, planning the largest event and milestone this organization has ever experienced. How is Convention different from our Centennial celebration? A: First – I LOVE Convention! I always tell my chapter members that Convention is the greatest SDT event they will ever attend. Centennial was an extra special occasion, one that I am certain sisters will remember for the rest of their lives. It was truly a party and our goal was for sisters of all ages to come together to celebrate 100 years of sisterhood. 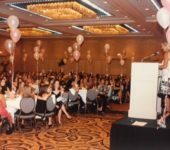 Centennial was unique for SDT in that many sisters attended who are not currently actively involved with SDT. Convention is an electric environment bringing together our chapter leaders and dedicated volunteers to share, learn, and motivate each other to make SDT an even better organization. 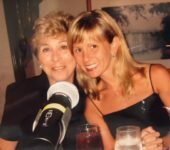 With her mother, Jane Metzger, just after being installed as National President in 2002. Q: You’ve attended 13 Conventions during your involvement in the organization. Which has been your favorite? A: I have never missed a Convention! I don’t think I have a favorite since they all have special moments. I will never forget 2002 when I was installed as National President because it was such an incredible honor, and my mother was installed as one of my National Vice Presidents. But I think my most favorite memories are the honorary initiations. 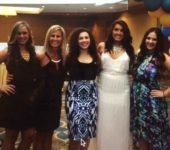 I loved that we initiated the moms of Michelle Carlson, Margaux Manley Lima and Alexis Feder. Watching my sisters, who I adore, share SDT with their mothers was magical, especially because I get to share that bond with my mother. Q: How has the Convention experience evolved or changed over the past 30 years? A: I believe SDT has gotten much better at creating a program that our membership values because we get their input through the Collegiate Leadership Team (“CLT”) and various survey methods. When I first joined National Council, we thought we knew what our members needed, but realized that it wasn’t necessarily always the case. I am so glad that we have evolved in this way, and I also love the peer-to-peer education. Having our CLT members design and facilitate programming has been a great addition to our Conventions. Addressing the Convention body at the 2004 Convention. Q: Is there anything you’re particularly looking forward to at this Convention? A: I am sure that the Convention team has planned an action packed, engaging program. However, my favorite part of Convention is meeting new sisters and learning about the unique events and activities they are doing on their campuses. I think this idea sharing is the best part of Convention. Q: A lot of our collegians have never attended a large scale National event. What’s something they may not expect, but should prepare for? A: It can be overwhelming to attend your first Convention. Just remember, you are not alone! Everyone is in the same boat and doesn’t know anyone except their chapter sisters. When you attend meals or sessions, just take a seat and introduce yourself to whoever is nearby. Try to meet as many sisters as possible in order to have the best experience. With members of the Delta Lambda chapter at the 2014 National Convention. Q: How can chapter delegates share key learnings and this experience with the rest of their chapter? A: Convention is amazing but it should be used as a catalyst to impact and improve your chapter. It is so important for chapter leaders to share the excitement of Convention while it is happening on social media, and then immediately after Convention, send out a communication to their chapter with Convention highlights. It’s important to not let the magic of Convention die over the summer months. Q: What should attendees not forget to pack? A: Do not forget to pack your cell phone charger, your Torch pin and cute outfits! For more information on the 2018 Sigma Delta Tau Convention in Cleveland, visit https://www.sdtincle18.org/.